Original Design Francis Kinney – lengthened from 12 feet to 14 feet.  Simon served his time with Rick Wood and Nigel Shannon at Timber boat Services in Snail Bay, Birchgrove. Rick Wood had built himself a classic 12 foot Frances Kinney dory in 1979 when he was a 4th year apprentice at Cockatoo Island. Ricko’s green dory was built in his brother Brian Wood’s furniture making workshop at Artarmon from Red Cedar Plywood. Rick launched her off the beach at Clontarf. This Dory has been his companion ever since. Together they have caught fish, surfed at Ballina, commuted to Scotland Island and Dangar Island, rowed daily from Balmain to Berry’s Bay, and had countless adventures together. In 1996, Brian Peate approached Rick to build a Dory, as he had admired Rick rowing his boat for years. Rick and his two apprentices Adam Mcclain and Simon, lofted the new dory, and stretched the original 12 foot design to 14 feet. A second boat was quickly built for Paul Shoppis. Aaron Harper, a rigger at Noakes boatyard commissioned a third hull off the mould. This boat was equipped with out riggers and a sliding seat, and in the fashion of the time was painted black! Rick’s older brother Brian, next constructed a dory off the moulds for Maggie Mclaren. MARY E was built at the Chowder Bay Boatshed by SWB shipwright Bob Mcleod and the two apprentices Troy and Wallace. She was constructed from 3/16” Gaboon plywood. All trim and transom were Mahogany or Red Cedar. Weight was kept to a minimum. The finished hull weighs in at 28kg. It is possible to build a hull in 130 hours minus painting. The Kinney rowing dory is a fantastic rowing machine. They carry a good load and are very seaworthy little boats. Their simplicity is their virtue.